MOTU MicroBook II: rocking the rugged look. 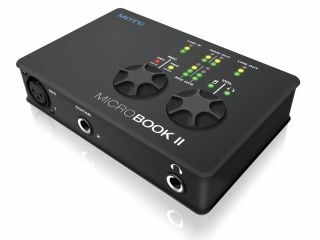 MOTU has unveiled the MicroBook II, an update to its compact, portable audio interface. Whereas the original MicroBook was a 4-in/2-out device, this one is 4-in/6-out. It's also been totally redesigned, and now features a hands-on volume control, USB 2.0 connectivity, an XLR input and 96kHz recording and playback. Read on to find out more. MicroBook II will ship in the Spring priced at $269, the same as the original version. Thursday, January 26, 2012. In a post-NAMM announcement, MOTU unveiled the MicroBook II, an updated version of the compact, studio-grade audio interface that turns a Mac or PC into a personal 4 x 6 recording studio with professional I/O and monitor mixing. The MicroBook II will replace the original model at the same price. "For discriminating users who insist on the very best audio quality, MicroBook II delivers unmatched performance for compact, personal recording," said MOTU Marketing Director Jim Cooper. "Plug in a mic, guitar, keyboard, and powered speakers, then enjoy sound quality that rivals other audio interfaces in the six to eight hundred dollar range." The four inputs (mic, hi-Z guitar, and stereo balanced line in) can be recorded simultaneously. The mic preamp delivers neutral coloration and pristine sound, with 20 dB pad and 48V phantom power for condenser mics. Engineered for exceptional audio quality, the MicroBook II includes balanced analog connectors and digitally controlled analog trim. Input trim is controlled separately from input mix volume, so that users never have to sacrifice sound quality for a balanced mix. Internal CueMix™ mixing and routing features let users program a different stereo mix for each output pair, consisting of any combination of live inputs and host audio tracks. Alternately, users can send the same mix to multiple outputs, or choose a separate output for the MicroBook's built-in test tone generator or white and pink noise generator. - 4-input, 6-output bus-powered "plug-and-play" USB 2.0 audio interface for Mac and Windows. - 6 x 8 physical input/output channels. - 8-bus digital mixer to route and mix live inputs with computer tracks. - Pre-amp equipped mic input with Precision Digital Trim™ 48V phantom power, and 20 dB pad. - Hi-Z guitar input with Precision Digital Trim. - Headphones output on quarter-inch stereo jack with independent volume control. - Output volume digital rotary encoder. Push to cycle among three modes: main out, phones, or both. - Mic input digital rotary encoder for adjusting trim level, 48V and pad. - Dedicated 3- or 4-segment LED meters for all inputs and outputs. - CueMix™ FX no-latency mixing and monitoring with EQ and dynamics processing. - Support for recording and playback at 2x sample rates (88.2 and 96 kHz). - Includes AudioDesk DAW software, USB cable, and mic cable adapter. The MicroBook will ship in the spring of 2012. Price is $269 USD.